Identification: Has no blue color. Upperside dark brown with orange veins and submarginal bands. Underside white with black spot pattern and red-orange submarginal bands. Wing Span: 3/4 - 7/8 inch (2 - 2.2 cm). Life History: Eggs are laid singly on leaves of host plant, which caterpillars eat. Second-stage caterpillars hibernate. Flight: One or two broods from May-August. 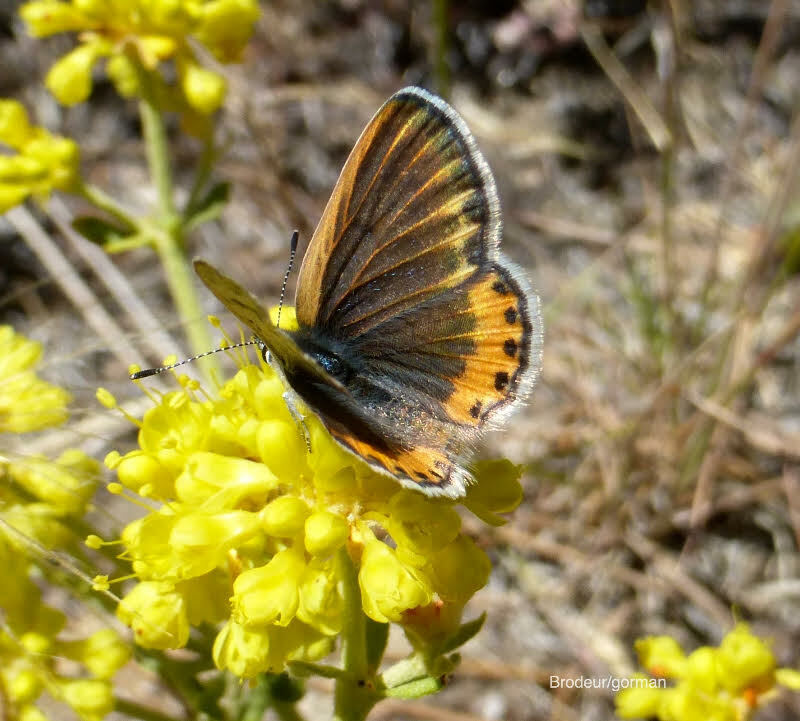 Caterpillar Hosts: Wright\'s buckwheat (Eriogonum wrightii) in the buckwheat family. Habitat: Rocky outcrops, hills, and ridges in the mountains. Range: Very local in southern California County, Tehachapi Mountains, mountains of San Bernardino County. Conservation: All populations are of conservation concern. Management Needs: Monitor populations and study the effects of fire, grazing, and exotic weeds.